The essential questions remain what they have always been: "what is freedom and what is its relationship to the truth contained in God’s law? what is the role of conscience in man’s moral development?" What is good and what is sin? What origin and purpose do sufferings have? What is the way to attaining true happiness? What are death, judgment and retribution after death? Lastly, what is that final, unutterable mystery which embraces our lives and from which we take our origin and towards which we tend? … These and other questions, such as: what is freedom and what is its relationship to the truth contained in God’s law? 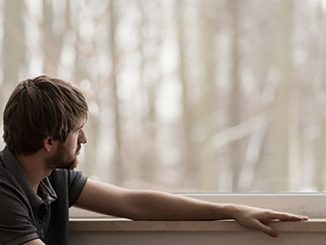 what is the role of conscience in man’s moral development? how do we determine, in accordance with the truth about the good, the specific rights and duties of the human person? That pastor was St. John Paul II, and he posed those questions in Veritatis Splendor (par 30), his great encyclical on the Church’s moral theology, released in 1993. While mindful, again, of the many issues involved, I am increasingly convinced that Veritatis Splendor, nearly a quarter century old now, is the elepha—er, encyclical in the living room. Of course, it does not stand alone, since John Paul II spoke often and wrote in detail about mercy, marriage, freedom, conscience, and a host of related matters over the course of his lengthy pontificate. In fact, every single issue relating to family, marriage, divorce, Holy Communion, culpability, subjective experience, and objective truth that Pope Francis has sought to address, analyze, explore, and grapple with since he announced the Extraordinary Synod of 2014 had already been addressed, analyzed, explored, and grappled with by John Paul II in the 1980s and 1990s. The 2014 Extraordinary Synod and the 2015 Ordinary Synod were held in order to address, as the USCCB site states, “topics related to the family and evangelization.” This was followed by the Apostolic Exhortation Amoris Laetitia, which is (at nearly 60,000 words) the longest official papal text in history. What has been the result of all of this time, labor, discussion, and ink? Judging by events of recent weeks and months, it has been much discord, confusion, and frustration, quite a bit of it revolving around that one question: “Are divorced and civilly remarried Catholics now able to receive Holy Communion?” Prior to the current pontificate the answer was “No”, as it was understood—if not always accepted or practiced—that those Catholics who had entered into a second “marriage” without addressing the validity or nullity of their first marriage were, in fact, committing adultery. CNS: Cardinal-designate Farrell has told CNS that he believes that under Chapter 8’s guidance, a pastor cannot say to all divorced and civilly remarried: Yes, receive communion. But neither can they say to all: No, it’s not possible unless you live as brother and sister. How would you respond to this observation? This point is essential: The Church cannot contradict or circumvent Scripture and her own magisterium without invalidating her mission. Further, what Archbishop Chaput wrote and said is in complete continuity with what John Paul II wrote and said on many different occasions. Farrell, it seems fair to say, was not just directly criticizing Chaput, but implicitly criticizing John Paul II. 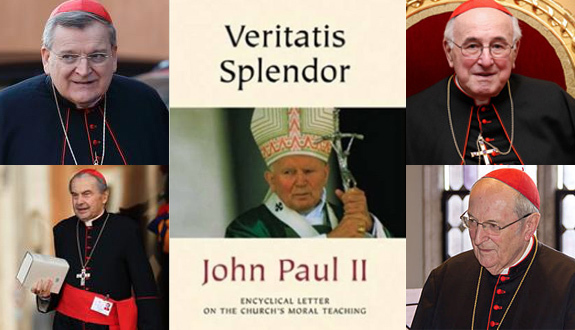 Note that all five questions mention or reference texts written by John Paul II (the third question references a text citing Familiaris Consortio n. 84 in the key section), and that three of them specifically mention Veritatis Splendor. And then note that Veritatis Splendor is not quoted, mentioned, or cited once by Francis in Amoris Laetitia. It is rather mind-boggling that Amoris Laetitia, which addresses a whole host of moral issues, fundamental principles, and especially the matters of conscience and freedom, completely ignores Veritatis Splendor. As John Paul II moves on in his commentary, he meditates on the negative injunctions of the second tablet of the Decalogue, and he takes this editing by Christ as the key to a moral distinction: the “positive moral precepts” leave far more room for prudence, in making an allowance for “exceptions.” But the commandments mentioned by Christ from the second tablet were “negative moral precepts,” and John Paul II treats those commandments as far more exacting, far less open to shading or compromise in the name of prudence. These negative precepts, he says, “prohibiting certain concrete actions or kinds of behavior as intrinsically evil, do not allow for any legitimate exception.” The Pope regards these precepts, then, as the hard, absolute guidelines to the moral life. They repel the claim that the principles of moral judgment are too airy or abstract to offer guidance in any concrete case. They are intelligible, precise—and unyielding. Exacting. Hard. Absolute. Precise. Unyielding. Would the great Pope and Saint John Paul II be called “rigid” today? Perhaps he would be dismissed (as he was a quarter century ago) as too black-and-white, too harsh, too unrelenting. I don’t say so glibly. The term “rigid” seems to be strongly trending these days, proving to be one of Pope Francis’ favorite negative descriptives, often linked to the sins of the Pharisees. Discernment is the key element: the capacity for discernment. I note the absence of discernment in the formation of priests. We run the risk of getting used to «white or black,» to that which is legal. We are rather closed, in general, to discernment. One thing is clear: today, in a certain number of seminaries, a rigidity that is far from a discernment of situations has been introduced. Francis then said, “I think Bernard Häring was the first to start looking for a new way to help moral theology to flourish again. Obviously, in our day moral theology has made much progress in its reflections and in its maturity; it is no longer a «casuistry.»” It was a rather startling remark since the German priest Häring (1912-1998) was a leading dissenter against Humane Vitae, and, as a 1989 article rightly observed, “has been writing and speaking without hindrance against Church positions for 25 years.” Häring inspired the work of Fr. Charles Curran, the leading opponent of Humane Vitae from the day it was released by Paul VI in 1968. “Häring himself then and later,” wrote Curran in 2013 in praise of the late German theologian, “without doubt became the most prominent and public proponent in the Catholic world for disagreeing with the conclusion of the encyclical.” Häring, in so many ways, was precisely the sort of moral theologian whose thought and work John Paul II addressed and criticized in Veritatis Splendor. Could it be that John Paul II is precisely the sort of moral theologian that frustrates Francis? If not, how to make sense of all this? Cardinals Farrell, Cupich, Kasper, and others repeatedly emphasize that each situation is unique and different, as if such an observation is a revolutionary leap forward in appreciating the mysteries of human existence. (Actually, in the case of Cardinal Kasper, that might well be The Point.) Then, when it is clear they are on the edge of the cliff of relativism, they insist on their belief in an objective moral law. The problem is that a truly objective and eternal moral law must exist outside of and above any subjective, temporal situation—and it certainly does, as John Paul II demonstrated so well. Thus, the question is: where does the uniqueness of my situation end and the objective moral law begin? How do we avoid the grave danger of “a radically subjectivistic conception of moral judgment” (as John Paul II put it) and instead embrace the fullness of the splendor of truth? But John Paul II said otherwise: “Consequently in the practical judgment of conscience, which imposes on the person the obligation to perform a given act, the link between freedom and truth is made manifest. Precisely for this reason conscience expresses itself in acts of ‘judgment’ which reflect the truth about the good, and not in arbitrary ‘decisions’. The maturity and responsibility of these judgments — and, when all is said and done, of the individual who is their subject — are not measured by the liberation of the conscience from objective truth, in favour of an alleged autonomy in personal decisions, but, on the contrary, by an insistent search for truth and by allowing oneself to be guided by that truth in one’s actions” (par 61). It is never acceptable to confuse a “subjective” error about moral good with the “objective” truth rationally proposed to man in virtue of his end, or to make the moral value of an act performed with a true and correct conscience equivalent to the moral value of an act performed by following the judgment of an erroneous conscience. It is possible that the evil done as the result of invincible ignorance or a non-culpable error of judgment may not be imputable to the agent; but even in this case it does not cease to be an evil, a disorder in relation to the truth about the good. Furthermore, a good act which is not recognized as such does not contribute to the moral growth of the person who performs it; it does not perfect him and it does not help to dispose him for the supreme good. Thus, before feeling easily justified in the name of our conscience, we should reflect on the words of the Psalm: “Who can discern his errors? Clear me from hidden faults” (Ps 19:12). There are faults which we fail to see but which nevertheless remain faults, because we have refused to walk towards the light (cf. Jn 9:39-41). Much more could be said. The bottom line, for me, is this: if the ambiguities and problems with chapter 8 of Amoris Laetitia can be clarified in accord with Veritatis Splendor, what really was the point of the past three years? Why wasn’t the Apostolic Exhortation more clear and precise from the start? Was it a failure of competence? Or something else? But if these questions and concerns are finally addressed and clarified in a way contrary to Veritatis Splendor, what then? At the very least, we will be in deep and troubled waters, for it would mark a break with the Church’s perennial teaching on bedrock moral truths. And, that being the case, if an Apostolic Exhortation written in 2016 can take magisterial precedence over an Encyclical written in 1993, what other teachings of the Church might be up for a less rigid, less black-and-white “evolution” (to borrow from Cardinal Schoenborn)? Contrary to the opinion of Cardinal Tobin, “reducing” this to a dubium is not “naive”, but quite necessary. After all, we aren’t in this situation because of the four cardinals. As one veteran observer of Church affairs remarked to me recently, “given the fact that bishops, including prominent cardinals, have different understandings of what AL allows or doesn’t allow, and these differences are very public, surely someone in Rome should publicly and officially indicate whether (1) AL maintains the status quo of FC 84, as Cardinal Mueller and certain others seem to think (Archbishop Chaput, the USCCB’s point man on AL, among them), or (2) it allows each bishop (or individual priest?) or bishops’ conference to decide how AL is to be understood, or (3) AL is supposed to be understood as allowing communion to the civilly remarried, on a case by case basis, so have at it. And, if the last, it would be helpful to know explicitly what principles should be employed to assess each case. This is why we have a Magisterium. ‘Figure it out for yourself’ is kinda, well, Protestant.” Dialoguing with Protestants is one thing; descending into Protestantism is quite another. So, the four cardinals and the entire Church—not to mention attentive non-Catholics—deserve a clear answer from the Holy Father. Considering how often he gives interviews and speaks to non-Catholic writers, surely he can find the time. To say so is not an act of rigid rebellion or insecure insolence, but a simple request that the “gift of the New Law”, as John Paul II described the deposit of Divine Revelation, be upheld and treasured, befitting those who seek to follow the One who is the Way, the Truth, and the Life. As He said: “Which of you, if your son asks for bread, will give him a stone?” (Mt 7:9).